Why is LastPass not being updated on Mozilla Add-ons? LastPass is a popular online password manager that is available for various web browsers. Well, it is actually more than a password manager as it ships with other features of interest, including different profiles for fast form filling, options to store files in the protected vault, and an option to create secure notes. Firefox users can download the password manager extension for their browser from Mozilla's Add-on repository, or directly from the LastPass website. One would assume that the versions are identical, but when you compare the versions, you will find out that this is not the case. 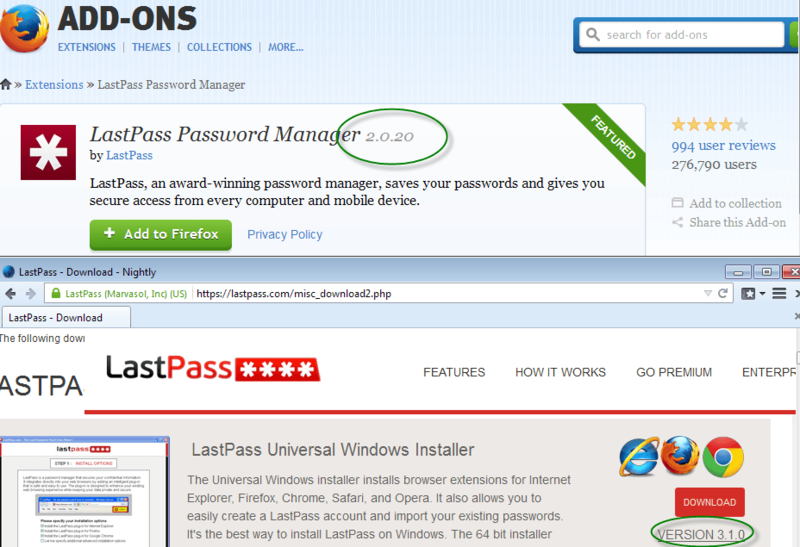 The latest version of LastPass that is offered on Mozilla AMO is LastPass Password Manager 2.0.20. The version was updated on March 13, 2013 and nothing has happened ever since. When you turn your attention to the LastPass website, you will notice that version 3.1.0 is available there for the Firefox browser. This version was released on February 14th, 2014. If you check the release log on the official website, you will find out that a total of four updates have been released for the extension since the Mozilla AMO version got last updated. So what is the issue here? First of all, there is no automatic update. If you install the password manager from Mozilla Add-ons, you may be totally unaware that newer versions are available because you are not informed about that. The only way to find out about it is to visit the LastPass website and check the latest version there manually. Second, you miss out on new features and fixes. The version 2.0.26 update for Firefox for example resolves several Firefox specific issues that came up in new versions of the browser. Why has not LastPass been updated on Mozilla Add-ons then? New versions are available, so that cannot be the issue. The review process may delay the availability of new versions, but one year, that cannot be it either. There is no satisfying explanation at this point in time. It is interesting to note that a new version of LastPass, version 3.1.1, was uploaded to Mozilla AMO on February 26. It is not listed yet on the main extension page, likely because it is still going through the review process. You can however download it by clicking on Version Information at the bottom of the LastPass page, and then on "see complete version history" afterwards. Here you find the new version listed that you can add to the browser to update the old version. It seems that a new version of LastPass will be released to Mozilla AMO in the coming days or weeks. If you are a LastPass user, you may want to check the version installed in Firefox and the version listed on the official site regularly to make sure you are always running the latest version. On my Palemoon Portable installed in my thumbdrive, it is on 3.+ track while the Waterfox I have on my laptop only has 2.0.20. I have no idea why there’s a discrepancy. And to be honest I prefer the 2.+ track for its classic user interface. The 3.+ changed a lot of things that I find myself being less productive. So I’m glad that my Waterfox is still on 2.0.20… not that I use it. I still use Keepass+Passifox for my password management. I have it in my Firefox updates this morning. It was released yesterday (3/1/14). Where I don’t see it is for Seamonkey, never do and it drives me crazy. I noticed this some time ago but did not bother manually updating because I dislikes the “universal installer”. But I hope they release updates more frequently on AMO. I just installed the XPI file from LastPass’s website. I do not remember where I found it on there but you do not need the universal installer. The author might have had more luck answering this question had he attempted to pose it to Mozilla or LastPass. by this very useful article! Please keep the good work. thank you very much for this information. It went completely by me that there were more recent versions of the LastPass add-on for Firefox available. I remember reading some time ago, that Mozilla hadn’t updated it because LastPass hadn’t supplied them with enough information, which Mozilla needed so they could complete the review. I think I read it on the AMO forum. Lastpass updated automatically to 3.1.1 yesterday on my Firefox install. I have the latest versions for Windows and Linux running in Firefox. Not sure why you don’t. Hmm My Firefox is still the old version, but Chrome auto-updated. It must be a Mozilla thing. Less so for Apple because they only allow certain extensions.. You can say “We;re as goinga s fast as we can” bla bla hogwash, but at the end of the day any plugins u add to a browser u got for the extentions page, relies on updates from that section… and if no updates are make u can say how great a store is, but unless its ket up to date always, its always gonna be second best. Cut out the middle man (meaning Mozilla) and go straight to developers site and at least then yous plugin’s/a extensions will always be up to date (where available) A community of Mozilla people may all well and good but their worthiness of keeping it up to date seems lacking… Lastpass is already up to version 4.1.26 on their website, but check Mozilla store and its still at 3.3.2 as of current.